Dr. Keene introduced a new form of magnification for graft dissection. 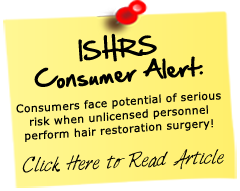 She first announced it at the International Society of Hair Restoration Surgery Florida conference in 2002, and then presented it in Rome in 2003. State of the art clinics are now adapting this improved form of dissection over the microscope. Research has shown that graft dissection using microscopic magnification reduces the incidence of transection, increasing graft yield during graft dissection. Table top microscopes have limited working distance and visual field, with limited range of motion for the users head and neck. Dr. Keene sought a way to improve ergonomics and magnification over the commonly used microscopes used by hair transplant clinics. 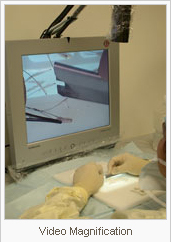 While seeking an ergonomically improved method of graft magnification, Dr. Keene worked with an engineer to co-develop the video magnification system, which not only offers ergonomic advantages, but also allows the doctor the opportunity to see every graft as it is being dissected. This also provides her the opportunity for maximum oversight and quality assurance before the grafts are placed! As they are dissected, the grafts are stored in chilled saline in a dissection kit that Dr. Keene designed to maintain optimal graft hydration throughout the surgery. The graft receptacles can be transferred directly to the doctor’s or assistant’s finger for placing, without additional graft handling. Graft drying is known to be one of the most detrimental factors influencing graft survival, and this system helps reduce the risk of graft drying by maintaining hydration during both the dissection and placing phases of surgery. Many clinics dissect grafts on a dry surface, place them in Petrie dishes, and then transfer grafts to a gloved hand -subjecting them to unnecessary handling and the risk of drying. 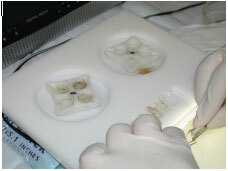 The use of the dissection kit decreases graft handling, and decreases the risk of graft dehydration.